On Sunday, August 28, Asheville School welcomed a record number of 289 students to campus on Opening Day. This marks the school’s 10th consecutive year with record enrollment numbers. Students are coming to Asheville School from 20 states and from 16 countries. Eighty percent of the students board and 20 percent are local day students from the Asheville area. The average class size consists of 13 students and there is a 4:1 teacher to student ratio. 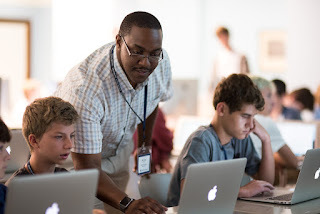 This year, students have an extra stop on the checklist to get them settled in for the start of the year—each will receive a new MacBook Air in a 1:1 computer initiative. These laptops will be issued by the school and at the end of their time at Asheville School, they will be given the option to purchase the laptop or give it back to the technology department. The computers allow for a new afternoon activity where students will learn to use Apple’s Swift programming language to create apps for Apple devices like iPhones, iPads, and Apple TV. “We can now teach App Development and dedicate more time to robotics, computer science, and engineering,” Williams said. Asheville School is a nationally acclaimed co-ed, college preparatory boarding and day school for students in grades 9 through 12. Recent graduates have been accepted to Amherst, Columbia, Davidson, Duke, Elon, Emory, Furman, Georgetown, Harvard, NC State, Rhodes, Sewanee, UNC-Chapel Hill, University of Virginia, Vanderbilt, Wake Forest, William & Mary, WashU, Wofford, and Yale among others.